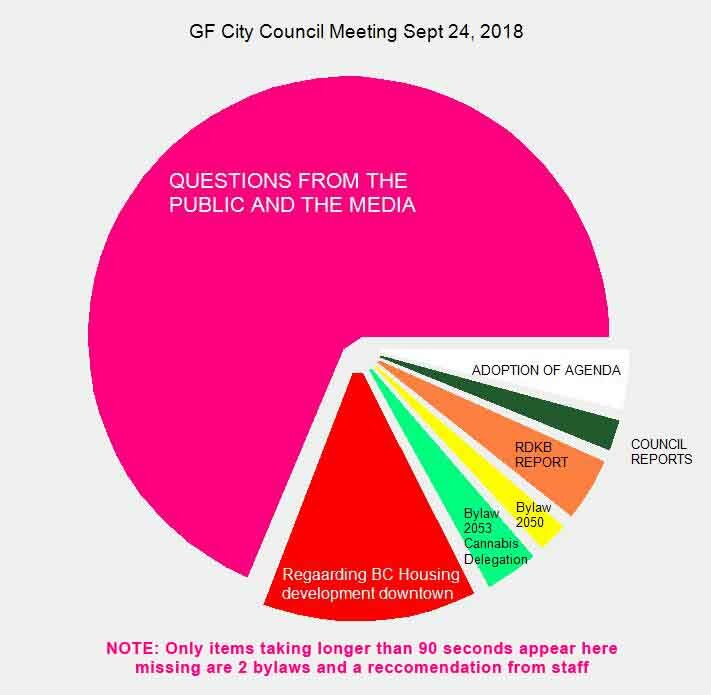 City Council had only one public meeting on Sept 24, 2018. There was a private meeting with BC Housing earlier in the day. The Monday evening meeting agenda wasn’t all that long. And the meeting itself progressed at a speedy clip with most of the agenda being dispensed with in less than a half hour. It was the extra stuff and question period that dominated the conversation time. First there was a Late Item added to the agenda by Councilor Tripp. This item was a discussion on whether or not a development permit should be allowed for the 2nd Street BC Housing development because the location was part of the flooded area of downtown. To some it appeared to be an attempt to thwart the construction of that development at that location. Then there were the attempts by councilor Butler to pry some meeting minutes out of staff – notes of a meeting that did not have any council participation but was attended by a staff member and, she maintained, a candidate for council in the coming election. It was the beginning of an effort that extended onto social media for the rest of the week as she attempted to hang the BC Housing Support Housing development around the neck of one of the mayoral candidates. Which one was not apparent during the meeting but as the days passed by it appeared to be Brian Taylor. When you look at the pie below keep in mind that agenda items that take less than 90 seconds to dispense with do not appear. That leaves out an Info Item and two of the Bylaws. Also note that the question period took up most of the time. In large part that’s down to me . . . arguing with council and the Mayor. I’d like to extend a thank you to those on Facebook who were not only paying attention but actively engaged by fact checking at least one of the points of contention. This entry was posted in City, government and tagged BC Housing, Borrowing, Bylaw 2045-A1, Bylaw 2050, Bylaw 2051, Bylaw 2052, Bylaw 2053, cannabis, Financial Plan, Nature Park on September 29, 2018 by gftvboss. 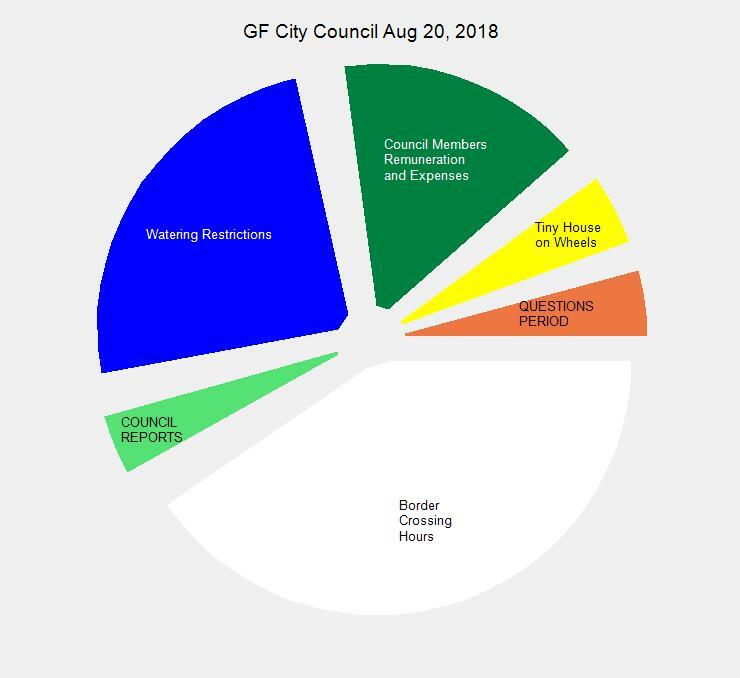 August 20 was another full day for City Council. First a 2 1/2 hour Committee Of The Whole meeting starting at 9AM. Then an in-camera meeting and finally an evening regular meeting at 7PM. Two organizations, gallery 2 and the Boundary Museum, came to give their quarterly reports. Watering restrictions (it’s that time of year) were on the agenda as well. The changes to border crossing hours had been on the previous agenda but the Commissioner for Ferry County, Johnna Exner, was unable to make that date (they also faced flooding and wildfire). She did make it this time. But the topics that generated the most back and forth discussion were a Temporary Use Permit for a Tiny House on Wheels. Remuneration for councilors and the mayor, and whether it should be Council or a Delegate that deals with applications for shops wanting to sell Cannabis. 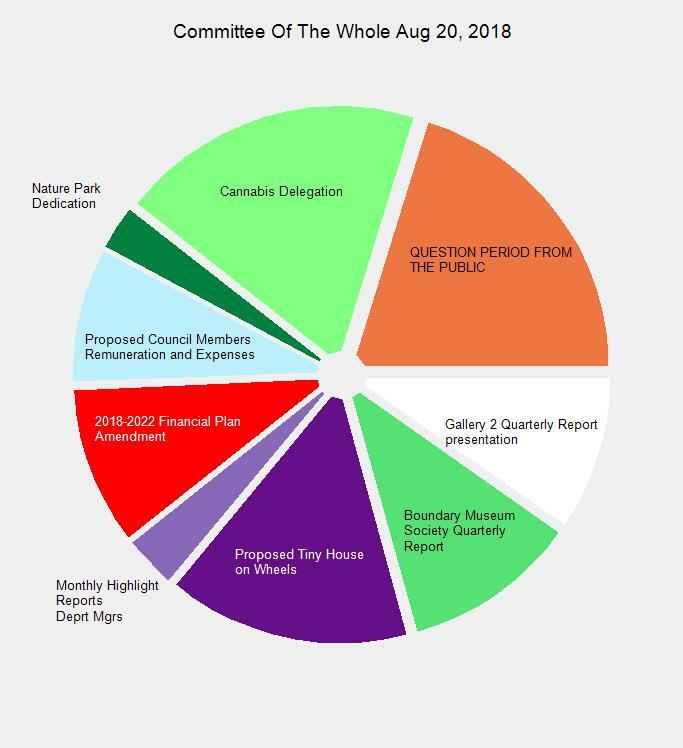 This entry was posted in City and tagged Bylaw 2045-A1, Bylaw 2049, Bylaw 2050, Bylaw 2052, Nature Park, Remuneration, Tax Exemption, Tiny House on Wheels, Watering Restrictions on August 21, 2018 by gftvboss.